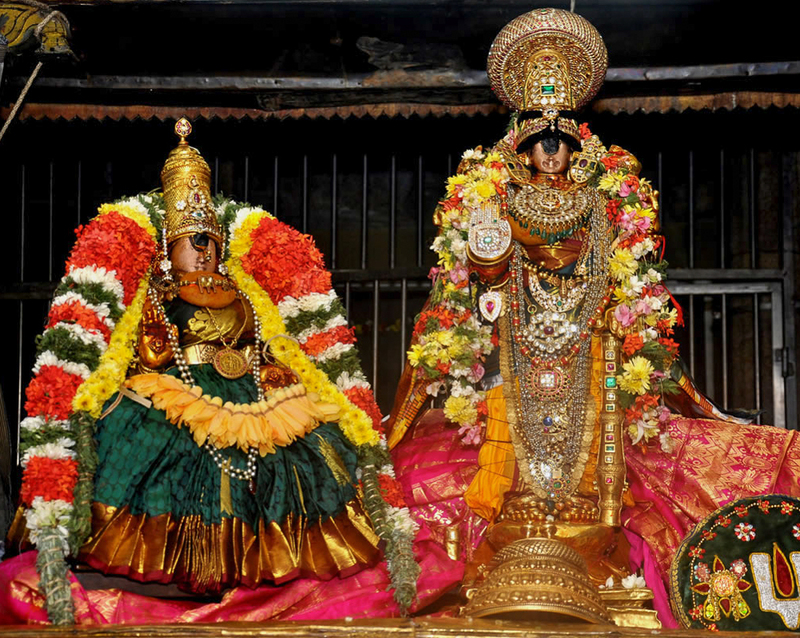 Sri Rangam Ranganatha perumal temple is a very important one for the vaishnavites among the 108 divya desams. The temple is situated in between the rivers Cauvery and Kollidam. The temple gopurams (towers) are so huge and majastic that these can be seen from as far as 10kms away as you enter Trichy. The temple is considered as one of the eight Sywayambu Kshetras of Sri Vishnu where the moolavar( presiding deity) is believed to have manifested on its own. Seven other temples are, Bhoo Varaha Swamy temple in Srimushnam, Venkateswara Temple in Tirumala,Totadri Naadhan Perumal Temple in Nanguneri which are in South India and Varaha Perumal in Pushkar, Badrinaryanan in Badrinath,Chakrapani in Muktinath, Devaraja Perumal Temple in Naimisaranyam are in North India. According to one legend, Lord Sri Rama,gave the idol of Sri Ranganatha to King Vibhishana after the Lanka war with Ravaanaa. When Vibhishana was returning to Sri Lanka via this holy place, now known as Trichy, the deity wanted to remain in this place,that later became to be known as Sri Rangam. You can see the moolavar Ranganathan facing South in his reclining posture, looking towards Sri Lanka. As per another legend, Vibishana was carrying the idol to Sri Lanka, and while crossing Srirangam, he placed the idol on the banks of Cauvery for taking rest. After performing his daily pooja, he tried to lift the idol, but could not lift.Lord Maha Vishnu appeared to him and said that he would like to stay as Ranganatha in the place that became to be known Srirangam. As you enter through the main entrance into the temple, the temple surroundings itself resembles a small town with many shops, eateries, coffe shops, houses for the temple staff and vehicles going in and out. The Mandapams The Hall of 1000 pillars, but actually 953, is a fine example of a planned theatre like structure.This hall made of granite was constructed in the Vijayanagara period (1336–1565). Sesharayar Mandapam is to the south of the Thousand Pillared Hall. It has 96 pillars each rising to a height of six feet. There are twelve lines of pillars. 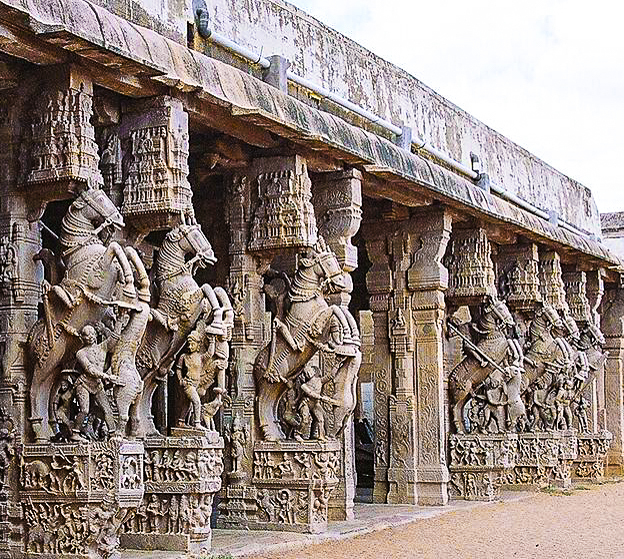 The pillars consists of sculptures of rearing horses with riders on their backs and fighting with their hoofs upon the heads of tigers. You can see a sculpture with the sharp edge of the sword piercing through the tiger’s mouth and is protruding out. Each pillar has been artistically sculpted. there are many other beautifully carved scuptures on the pillars.Most of the incidents depicted are tales from the Ramayana and Dasavataram. The ten avatars of Vishnu, Krishna leela and a fierce Narsimha are also seen. Do not forget to visit these halls when you are in the Srirangam temple. 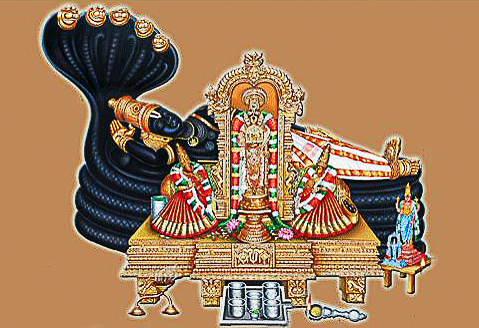 Thayar of this sthalam is Ranga Nayaki (Ranga Nachiyaar). Ranganayaki shrine is in the second praharam of the temple. Here goddess Ranganayaki is called as 'padi thaanda pathni', (a devout wife who doesn't cross the house bondary without her husband's wish). The utsavar idol (festival deity) of Ranganayaki does not come out of her shrine and it is Ranganathar who is taken to Ranganayaki during festival days. Pagal Pathu(10 day time festival) and Raa Pathu(10 night time festival) are celebrated in the month of Margazhi(December–January) for twenty days. The first day of Raa pathu is Vaikunta Ekadashi. Nammazhwar, one of the 12 azhwars, is believed to have ascended to vaikuntam(the heavenly abode of Vishnu) on vaikunta ekadasi. 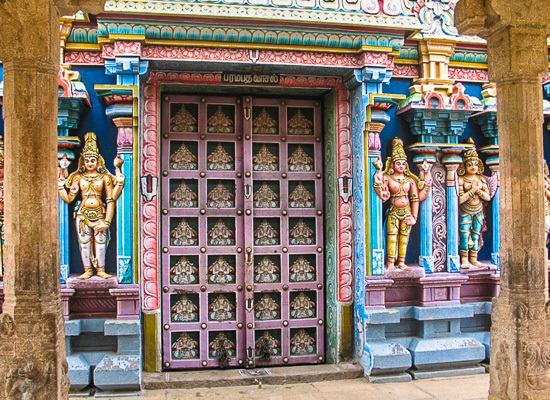 The utsavar is brought to the 1000 pillared hall on the morning of Vaikunta Ekadashi through the Paramapada Vasal (gate to Vaikundam ).After the deity passes through these doors,hundreds of thousands of pilgrims rush to enter as it is believed that those who enter here will reach vaikuntam (heaven) after death. The gate is open only during the ten days of Pagal Pathu (10 day time festival). The annual Rathotsavam (temple car festival) is celebrated during the Tamil month of Thai (January–February) and the utsavar is taken round the temple.Vasanthothsavam is celebrated during the Tamil month of vaikasi (May–June). The annual Jyestabisheka (gold ornament cleaning festival) is celebrated during the Tamil month of Aani (June–July). The idols of all deities are bathed with water brought in large gold and silver vessels. Temple location It is situated in the centre of Srirangam town. Temple Timings The sannidhi of the moolavar is often closed for abhishekams and pooja. Viswaroopa seva from 06:00	to	07:15 is very auspicious. No darshan from 07:15	to	09:00 and 12:00	to	13:15. General darshan from	09:00 to 12:00 and 1:15pm to 6.00pm and from 6:45pm till 9:00pm when the temple closes. These timings too are subject to change during festival days. To facilitate quicker darshan, there are special entrance tickets available at the counter as you near the sanctum. How to reach? Srirangam is around 12kms from Trichy. It is easily accessible by road and plenty of local town buses and autorickshaws,cabs available from Trichy. Srirangam, Tiruchirappalli – 620 006.